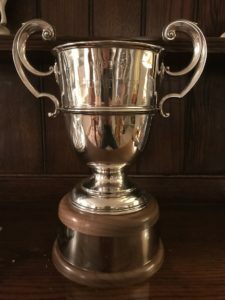 We have recently purchased a trophy which has been named the Rook Cup, after Mrs Rook, former DC of our Pony Club. Photo of trophy attached – it is well worth winning! Mrs Rook was very keen on tack and turn out and all members always looked amazing at her rallies. In her memory we are going to award this cup on a quarterly basis to the best turned out member of our pony club when attending rallies. We are awarding points to the children at each rally they attend for ‘tack and turnout’ with the lovely cup being awarded to the child with the most points at the end of each quarter. Polished boots, tidy children, clean ponies and sparkling tack will all be taken into account but with the effort to be made by the children as well as the parents. Not something to get too stressed about though, a fun idea to try to encourage pride in the children’s appearance. Rally organisers will check tack and turnout of the children that attend rallies and record this on the rally return form. The trophy will then be awarded every quarter to the child whose tack and turnout best matched the criteria below. The Beaufort Hunt is a Branch or Area of The Pony Club.